To show emphatically that Prime Minister and his government are 100% behind Iskandar, IRDA was established in 2007 by a Federal Act of Parliament and is tasked to bring Iskandar Malaysia to life. act as the principal coordinating agent on behalf of the government agencies in relation to receiving, processing and expediting the requisite approvals. Director of Khazanah Nasional, State Secretary of Johor, Director of Johor State Economic Planning Unit and Chairman/CEO of Johan Holdings as Board Members. 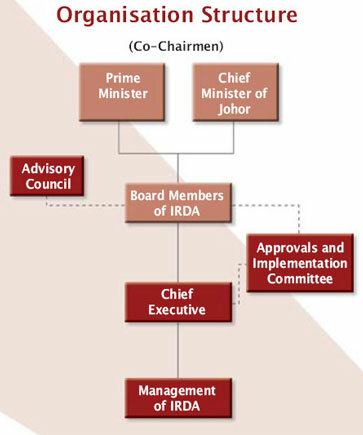 Dato' Ikmal Hijaz Hashim is the Chief Executive Officer of IRDA. The Advisory Council is jointly chaired by the Prime Minister and the Chief Minister of Johor together with five well established and renowned Malaysians.